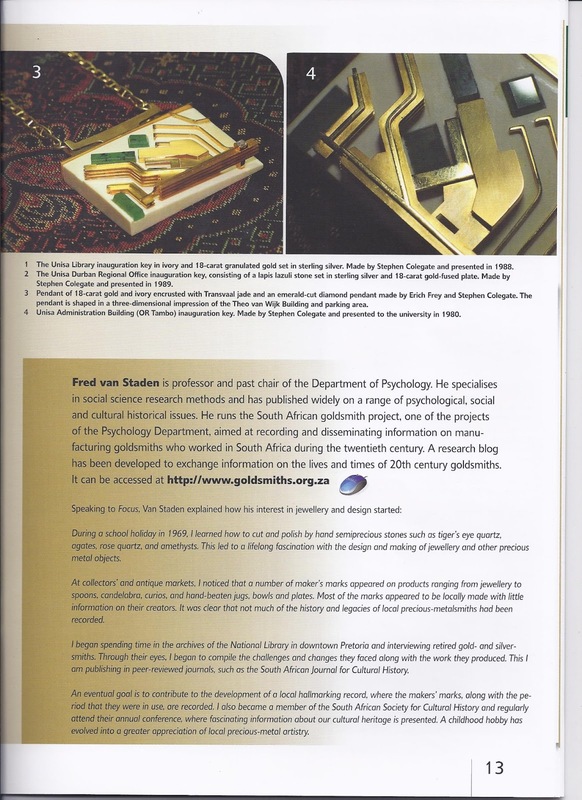 This blog is dedicated to research with the aim of gathering and disseminating information on 20th Century manufacturing goldsmiths in South Africa. For a brief moment during the mid 1970’s, a number of local goldsmiths came together to create a better structured environment in which they could work. They formed the Goldsmiths Guild of S.A. It was a time of hope and enthusiasm, but it did not last long. Even though all of the founder members enjoyed national recognition for their work, their technical and creative brilliance were not strong enough to withstand the forces that were working against them. Within a decade their dream of a better future fell apart. Late in 1973, under Peter Cullman’s leadership, the Goldsmiths Guild of South Africa was born in Johannesburg. Other founding members were Erich Frey, Dieter Dill, Ewald Kratz, Liz Bezuidenhout-Kratz, Kurt Donau, Jochen Kessel along with Hartmut and Ilse Jäger. All, except for Liz Kratz, were immigrants from Switzerland or Germany. They were extensively trained and highly skilled precious metal artists with master’s degrees in design and goldsmithing along with qualifications in gemmology. The majority were schooled at Pforzheim in Germany. A three page constitution was adopted at the founding meeting of the Guild. Their aim was to produce and promote high quality jewellery as an art form and to hold nation-wide and international exhibitions. Another lofty ideal was to raise public awareness of the originality of South African designed gold and silver jewellery. The association was to meet from time to time to plan the implementation of its aims as well as to share information on new designs and techniques in experimental jewellery making( including the use of facetted gem-stones, mineral specimens as well enamel). No jewellery of repetitive or ordinary nature may bear the logo stamp of the guild. Membership of the Goldsmiths Guild was optional and recommendations made by the Guild were not binding to the local goldsmith community. From the onset the Guild gained representation at the S.A Jewellery Council. Nevertheless, the proper organisation of the Industry as a whole (which included the field of gemmology) remained open ended throughout the twentieth century. At an Intergold jewellery competition held by the Chamber of Mines in 1974, members of the Goldsmiths Guild received 10 awards including three first prizes and the most outstanding design in gold. 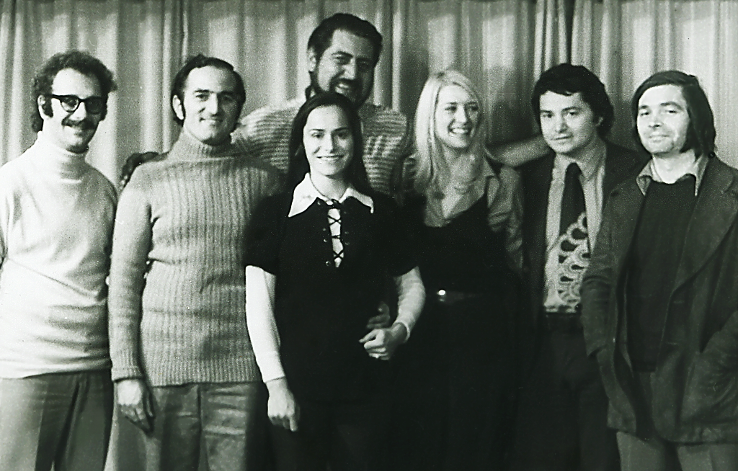 In 1977 Ewald and Liz Kratz won the coveted Diamonds International award. In 1975, two years after their formation, the members of the Goldsmiths Guild arranged their first group exhibition in Johannesburg to be followed by an exhibition in Stellenbosch later in the same year. A total of 120 pieces in silver, gold and platinum were on display. A number of other exhibitions were also held by twinning haute couture with artist jewellery. Jewellers and dress designers collaborated on designing clothes with fitting jewellery that was exhibited in fashion parades at the Rand Eater show. In 1979 the guild even opened a short lived Goldsmith Gallery in Rosebank, Johannesburg where they intended to feature permanent exhibitions by South Africa’s foremost goldsmiths. Given the individual and unique design of every piece they made, these goldsmiths were artists in their own right. Precious metals became their sculptural bases with which they combined texture, relief, line and colour to create jewellery of high quality. Precious stones were integrated in their designs to punctuate or emphasize aspects of their compositions. However, with youthful boldness, this generation of goldsmiths also expanded their palette of design materials to include organic elements such as wood and ivory. In some cases, copper and perspex were also integrated in their designs. They also celebrated the abundance of South African semi precious stones by absorbing these into their work. The imaginative captivation of unique colour tones inherent in stones such as tiger eyes, amethysts, agates, rose-quartz and jade in their creations, gave way to an increasing acceptance of semi-precious stones as part of leading jewellery design in South Africa. Some goldsmiths used their well developed technical skills to collaborate with local painters and sculptors in giving expression to sets of jewellery and flat ware. For example Kurt Donau collaborated with Cecil Skotnes, Edoardo Villa and Hannes Hars on a number of occasions. In 2012 a pair of cuff links designed by Cecil Skotnes and made by Kurt Donau was auctioned for R9 500 by Stephan Welz & Co. in Johannesburg. 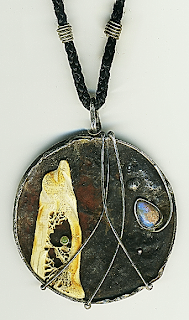 In another collaboration, Erich Frey worked with Walter Batiss and Alexis Preller on creating jewellery ware and medallions. Frey’s legacy is also gaining increasing attention at auction. In February last year, at the Strauss & Co. auction in Cape Town, a collection of Erich Frey jewellery that contained bangles infused with elephant hair, were sold well above the auctioneers’ estimates. Figure 3: Cecil skotnes and Kurt Donau collaboration. Silver and 18ct gold cuff links. Sold by Stephan Welz & Co. for R9500 in April 2012. Figure 3: A sea urchin brooch in gold with diamonds and a pearl by Peter Cullman. However, the conditions in which the Guild did its work conspired against their successful growth. Chief amongst these was an unresponsive and largely indifferent government that looked upon the profession with suspicion. More often than not, local goldsmiths were regarded as potential illicit traders of raw precious metals. Consequently, little was officially done to nurture and develop an organised community of resident gold- and silversmiths. Only in 1987 was the South African Jewellery Association formally recognised as a representative body by the government. Political instability caused by the policy of separate development along with the job reservations act further compounded the problem of rooting an indigenously sound and prosperous goldsmiths association. Whereas little formal training and job opportunities for black South Africans existed in the sector during the 1970’s, white goldsmiths had to deal with increasing international sanctions that made exposure of their work very difficult, resulting in having to work in a small local market. Also internally, within a few years of its formation, the Goldsmiths Guild began to neglect the mandate contained in its constitution. Already in the early 1980’s their group exhibitions began to dry up and some failed to implement the recommended hallmarking system. During the late 1970’s members of the Guild began to emigrate to other countries, especially after the Soweto riots in 1976. Over the years that followed, all of the founding members of the Goldsmiths Guild of South Africa took their considerable skills to settle elsewhere. Along with political instability, a sharp increase in theft and violent crime compelled most to emigrate from South Africa. Peter Cullman relocated to Toronto while Erich Frey and Dieter Dill returned to Germany. Kurt Donau resettled in his native Switzerland. Ewald and Liz Kratz as well as Hartmut and Ilse Jäger emigrated to Australia. By the late 1980’s membership numbers have dropped to such an extent that the Guild was not deemed to be a viable association anymore and the remaining members amalgamated with the Jewellery Manufacturer’s Association. The formation of the Goldsmiths Guild of SA represents a notable effort to create an organisational platform for the advancement of high quality local jewellery. Unfortunately, due to the constraints at the time, it was destined to become only a momentary flash in the pan of our local jewellery making history. Some jewellery manufacturers from the mid twentieth century became early explorers of African inspired work in the world of precious metal artistry. Thematically, their naturalist expressions of African animal, plant, cultural and mineral bounty have laid the foundation for the development of a South African design style that continues to be built upon and reformulated up to the present. Also, progressing from the singular use of precious metals and semi-precious stones in the early days, the use of mediums have diversified to any combination of varied indigenous materials such as ivory (not yet banned during these early years), wood, bone and even animal hair paired with semi/precious stones and often a mix of metals. 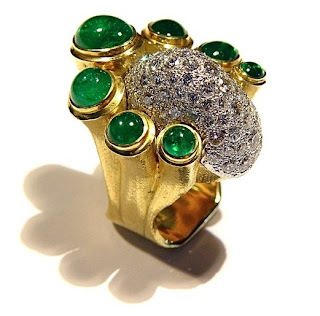 Perhaps it is fitting that the first full time female goldsmith in South Africa was also responsible for initiating a South African jewellery design aesthetic that grew organically from her perceptive engagement with her adopted fatherland. Like Walter Batiss a few years before her, Else Wongtschowski also celebrated in her work the art making of our African cultures. What’s more, she was one of the first of her generation who appreciated the wealth of design possibilities locked up in the use of the abundance of Southern African semi-precious stones. These two actions lay the groundwork or fundamental matrix from which a South African styled jewellery aesthetic would slowly emerge. At around the same time during the mid twentieth century, the workshops of Haglund in Johannesburg and Joe Calafato in Pretoria also took up the challenge to produce African inspired jewellery ranges and flatware that contributed greatly to the development of an indigenous artistic appreciation of the African world in which they were operating. 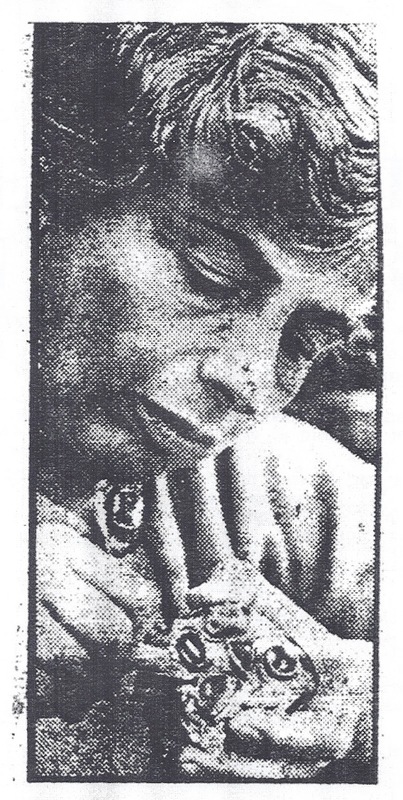 Figure 1: The first female South African manufacturing goldsmith, Else Wongtschowski in the early 1970’s. Else Wongtschowski (née Reinheimer) was born in 1914 in Frankfurt-am-Main, Germany. In 1933 she relinquished a career in medicine in favour of a goldsmith apprenticeship in Frankfurt. At the onset of the Second World War, she immigrated to South Africa. She worked for Kurt Jobst for a year after which she opened her own studio. 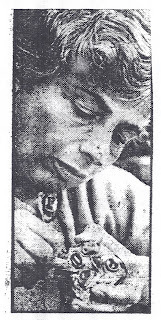 Ms Wongtschowski and her husband Hans were ardent mountaineers and have mapped a number of hiking routes in the Drakensberg as recorded by the Mountain Club of South Africa. In the mountains they came across bushman rock paintings. In 1949 this served as the inspiration behind the creation of a bracelet containing representations of bushman rock art. She was the first local jewellery manufacturer to set the tone for the development of a South African jewellery design theme that was later to become known as safari jewellery. She was known as an innovator and was also the first to introduce multi-coloured bracelets (often with stones she collected herself) to the South African market. Her design inspiration was instinctual rather than analytical, guided by the particular combination of semi-precious stones at hand. She was of the opinion that it is …Far better to have a well fashioned semi-precious ring or brooch than an ill designed diamond ornament. From the mid 1950’s, like Else Wongtschowsky a few years before them, Haglund Jewellers in Johannesburg began to create jewellery designs with themes depicting traditional African cultural life and wildlife images. The nephew goldsmiths Hans Blum and Rolf Waizenegger were the owners and they also gained inspiration from Bushmen rock art for some of their souvenir jewellery designs. But they went further and extended their collection by adding cultural images, such as head dresses, village life and animal studies to their design portfolio. The anthropological tones inherent in their work have contributed to its collector’s value. Figure 2: Early Haglund expressions. 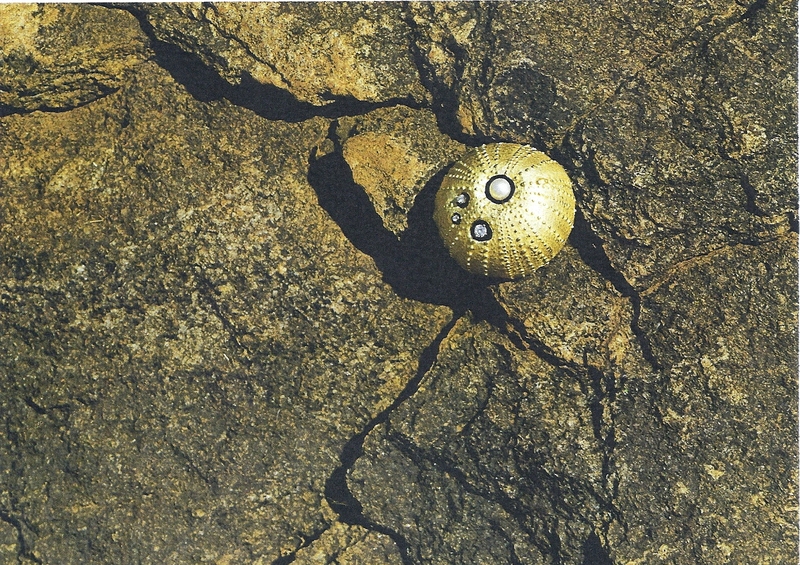 Figure 3: Gold, beads and diamonds: Geoph Foden, taking the early Haglund work to a new level. Given his extensive training in Germany, Hans Blum became one of the foremost practitioners of precious metal piercing in the country. This consisted of using a hacksaw to cut fine silhouette outlines from oxidised silver plate. Waizenegger contributed to their design base through stylised wiring expressions of animals, in addition to the modelling of relief designs of wild fauna in plasticine and pewter for silver casting. Working primarily in silver, their jewellery consisted of a combination of hand made and casting techniques. Geophrey Foden joined the business in the 1970’s and contributed to a refinement of the early Haglund work to reflect the tastes of the time. They continued to incorporate bushman art in their jewellery designs, along with the setting of locally available semi-precious stones. Throughout the latter half of the twentieth century the workshop created reinterpretations of African wildlife expressions, culminating in combining hues of gold, black and silver (incorporating pearls, diamonds or ivory) with mixtures of matt and gloss finishes, and at times imbued with ceramic beads. 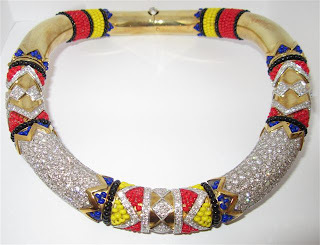 It gave expression to an emerging South African styled precious metal artistry, known as safari and wildlife jewellery. A third manufacturing workshop that helped pioneer the indigenisation of jewellery design, was owned and managed by Joe Calafato. In 1947 he resigned from his job as designer jeweller at the South African Mint and opened a jewellery workshop in the Pretoria city centre. From that time onwards until the end of his career in 1984, a time line can be captured in his design development. It is expressed in terms of a fading European influence mingling with a strengthening African influence both in terms of inspiration and form. A clear migration took place from his original retro moderne scroll abstractions to ‘organic realism’ in expressing plant, animal and human form, culminating in an almost exclusive emphasis on African landscape, animal and village life. At the end of his career, his work matured into extensively embracing images of the African continent, making him an African manufacturing jeweller in the full sense of the word. Figure 4: African female studies designed by Joe Calafato in the 1950’s. Calafato’s early African images dealt almost exclusively with stylish African female figures clad with cultural accessories that include headdresses, large rounded earrings and beaded necklaces. It expressed a fascination with culturally traditional female African beauty. A few images of children were also included, one of which became noted in its own right. It was pressed in the form of a brooch and consists of a young boy eating from a three legged pot with a wooden spoon. Perhaps because of its endearing quality, it became one of very few compositions that was additionally stamped with a descriptive title, namely ‘lo umfaan’. Figure 5: ‘Lo umfaan’ brooch in sterling silver designed by Joe Calafato during the early 1950’s. From 1972 onwards his depictions became more complex by adding rural background arrangements consisting of trees, rocks, tufts of grass, mountains, rondavels and aloes in bloom. Especially in this later work he incorporated traditional icons of African culture such the drum, the milling block with pounder, spear and shield, clay bowl, knobkerrie, amulets, ankle rings, reed mat, loin cloth and musical instruments. With these elements scenes such as hunting, drumming, dancing, maize pounding, socializing, music making and eating were composed. The designs pay lyrical homage to African expressions of nurturance, protection and beauty. Calafato’s wildlife studies developed parallel with and in the same way as his African imagery. It started off as individual animal figures that over time expanded to more complex compositions placed within rural landscapes (almost like small three dimensional paintings in metal). These include studies of the larger mammals such as elephant, giraffe, lion, leopard, various antelopes and zebra. Sometimes indigenous wildlife and African cultural elements were combined in the layout of the piece. 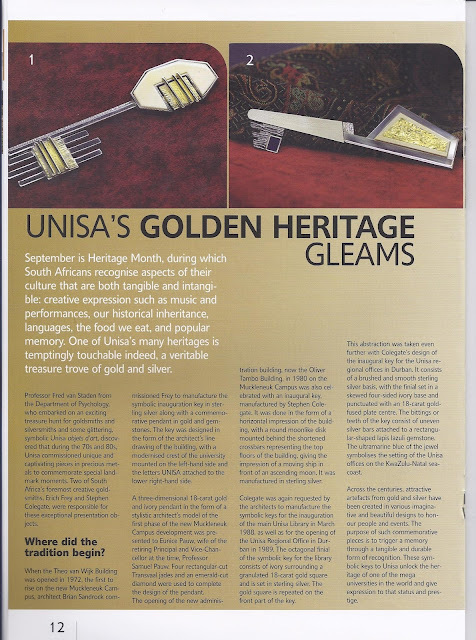 The aim of this blog is to gather and disseminate information on 20th century gold- and silversmiths in South Africa. This include the recording of names, maker’s marks and the dates they were in use, contributions, biographies of the gold- and silversmiths, published and as yet unpublished information along with interviews on the history of the creative precious metal market in South Africa. I have published a few articles on this topic in the South African Journal of Cultural History. in the process of gathering information, I realised that much more on this era of gold- and silversmithing in South Africa still needs to be uncovered and documented. Hopefully this website will be of use to gather information on the legacies of local gold- and silversmiths. Please feel free to comment and add information that may be helpful in refining and colouring in our memories of the goldsmiths of South Africa and their work during the 20th century. My fascination with the creative joy behind precious metal artistry has made me want to know more about South African precious metal artists and their creations. I know there are others too who share in this quest to record our gold- and silversmiths' pursuit of beauty and wonder - an appreciation of the interplay amongst design, texture, colour, reflection of light. During a school holiday in 1969, I learned how to cut and polish semi-precious stones by hand. This lead to a life long fascination with the design of jewellery. At collectors' markets I noticed the makers' marks of local jewelelry but found very little documented information. I began spending time in the National archives and interviewing retired goldsmiths Through their eyes, I began to record and compile as much as I can about their legacies. A childhood hobby has evolved into agreater appreciation of local precious metal artistry.